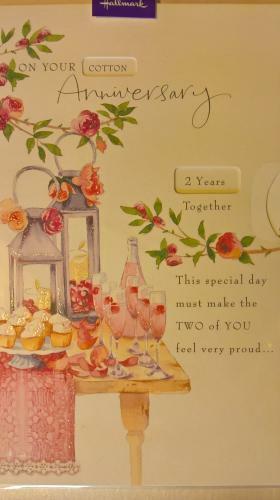 This card has a wheel which turns to reveal the anniversary you want and what it signifies. 1year.... paper, 2 years..... cotton, etc. The years available on the wheel are 1, 2, 3, 4, 5, 6, 7, 8, 9, 10, 15, 20, 25, 30, 35, 40, 45 and 50.